Donate « Central Florida Veterans Memorial Park Foundation, Inc. The Central Florida Veterans Memorial Park was built to honor those who left our community and never returned and to help heal those who did come home. The Memorial is a peaceful place for patients, families and friends to heal, pray, relax, reflect and connect with their loved ones. It honors approximately 1,100 veterans from Orange, Lake, Brevard, Osceola, Seminole, and Volusia Counties who made the ultimate sacrifice. 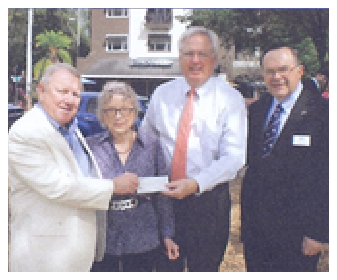 Early in the campaign Alan Starling, CEO of Starling Chevrolet, provided the Starling Matching Gift Program which was a great success for Phase I for the construction of the Memorial at Lake Nona adjacent to the VA Medical Center. General Jay Garner of Windermere presented the first $1,000 check toward the Matching Gift Program to Alan Starling and his mother, Grace. Jerry Pierce, former Chairman of the Central Florida Veterans Memorial Park Foundation, Inc., expressed his appreciation. The Endowment Fund was established for continued maintenance of the Memorial and will continue to be funded by Donors. Since the opening of the Memorial in November, 2013, a better understanding has been gained of the expenses required to keep the Memorial well maintained. To cover such costs the Foundation included in its fundraising campaign an endowment to be invested and earnings applied annually for the upkeep of the Memorial. Click here to download this page for mailing with a check or with credit card information. A COPY OF THE OFFICIAL REGISTRATION AND FINANCIAL INFORMATION MAY BE OBTAINED FROM THE DIVISION OF CONSUMER SERVICES BY CALLING TOLL FREE AT 1-800-435-7352 WITHIN THE STATE. REGISTRATION DOES NOT IMPLY ENDORSEMENT, APPROVAL, OR RECOMMENDATION BY THE STATE.